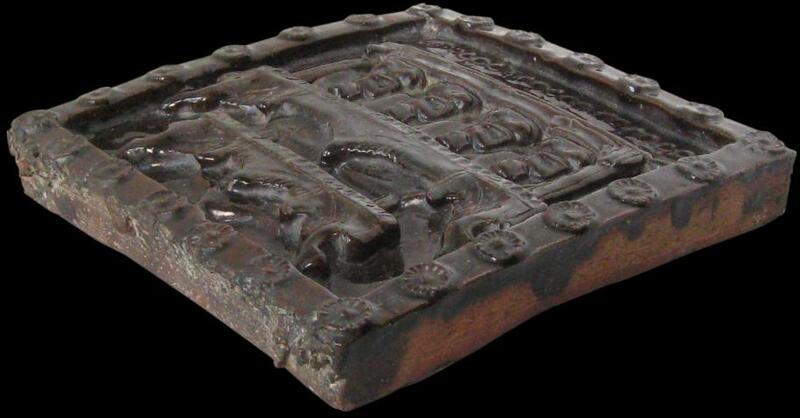 This tile, of brown earthenware, is coated with a thick monochromatic chocolate brown glaze. It is from Mingun, near Mandalay in Upper Burma and was commissioned in the late eighteenth century by the local king for a massive temple complex that was never completed. Because the complex was not completed, this tile was made but not installed. Consequently several similar tiles are known outside Burma, including one in the Victoria & Albert Museum (V&A) in London. The tile is impressed with a scene that illustrates part of the Jatarka story (the lives of Buddha) which is mentioned in the Burmese inscription at the bottom – perhaps it shows a Buddhist Council. Four seated Buddha-type figures are shown in a temple complex, framed by a border of 24 wheel-like rosettes. The Mingun pagoda was to be the centrepiece of an ambitious building project initiated by King Bo-daw-hpaya who ruled 1782-1819. The complex appears not to have been competed because of a shortage of funds, and then in 1839, part of the structure was damaged by an earthquake. 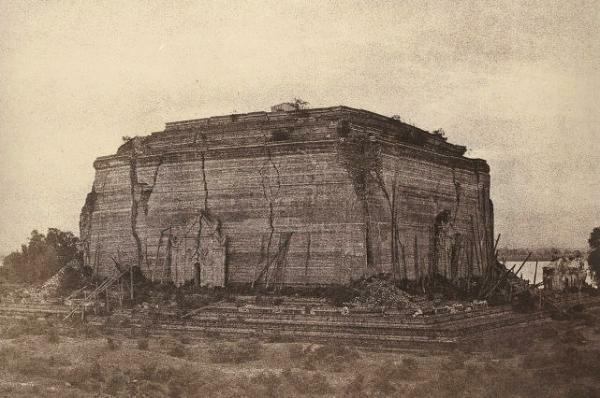 Even in its current dilapidated state it is the largest brick temple in Asia, and possibly the largest brick pile in the world – its outline dominates the western bank of the Irrawaddy River adjacent to Mingun village. Part of the complex includes Asia’s largest solid-cast bell – 4 metres tall and weighing 90 tonnes. The bell today stands nearby the pagoda. 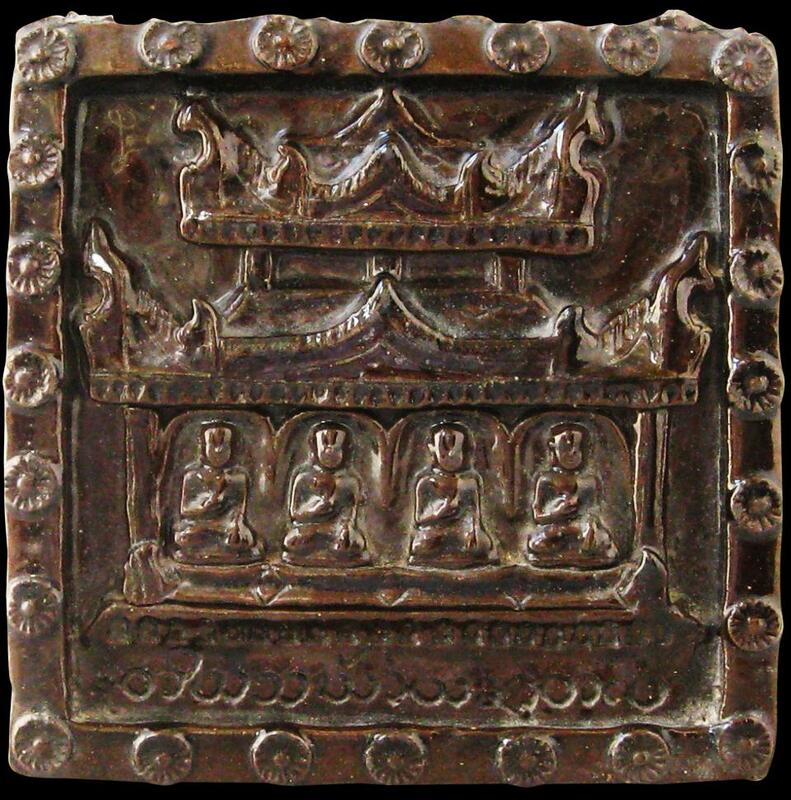 Fraser-Lu (1994) argues that this and the other tiles like it appear to have been the last set of religious ceramic tiles commissioned in Burma and that the tiles commissioned by King Bo-daw-hpaya probably were made by descendants of the potters that were taken as prisoners of war by Bo-daw-hpaya’s father king Alaung-hpaya after his conquest of the kingdom of Pegu in 1757. The potters were required to establish a new potting village where they accepted royal commissions after their arrival at Shewi-bo, Alaung-hpaya’s capital. The Victoria & Albert Museum’s tile is impressed with a similar scene and is of similar proportions. It does however have some chipping which this example does not. 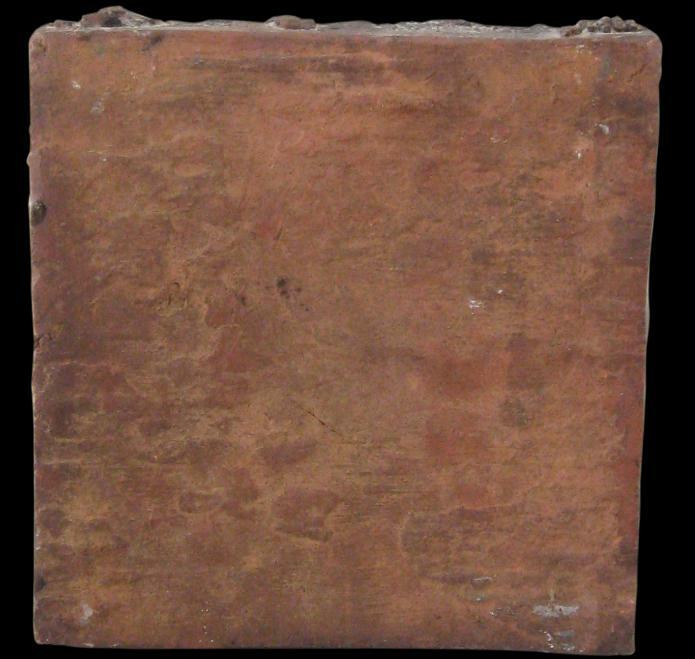 Indeed, the condition of this example is excellent; it is without chips or cracks, but does show appropriate aging and patina expected for a tile of this age. The V&A tile is illustrated in Lowry, J., Burmese Art, Victoria and Albert Museum, 1974. Also see Fraser-Lu, S., Burmese Crafts: Past and Present, Oxford University Press, 1994, p. 205 for another example. An early engraving of the Mingun Pagoda. 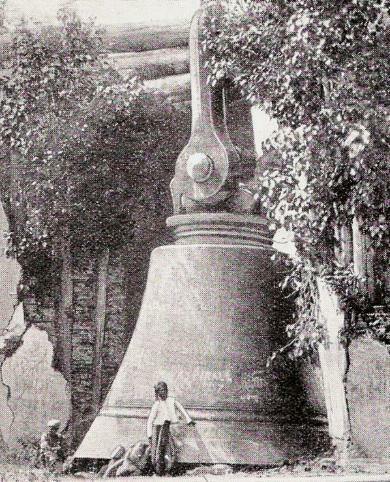 An engraving of the giant bell at Mingun, which like the tiles, was never installed.